Israel says one of its fighter planes has shot down what appeared to be an unmanned balloon which had flown over a top-secret nuclear facility. A military spokeswoman said an investigation had been launched into the incident. Israel has designated airspace above the Dimona site in the southern Negev desert a no-fly zone. In October last year an ultralight aircraft was forced to land after it accidentally flew over the area. The spokeswoman said the fighter plane "shot down a suspicious flying object, probably a balloon". Israeli media said the balloon was unmanned but powered by an engine. "It definitely flew over Dimona, although we are still trying to determine what that entailed and the military is now handling the matter," another official said. During the 1967 Mid-East war, an Israeli missile shot downed a crippled Israeli warplane that had strayed into the restricted zone, killing the pilot. 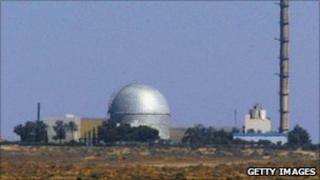 The Dimona facility is said to have produced nuclear weapons. Israel neither confirms nor denies having nuclear weapons under its policy of "ambiguity".